Soldiers take turns running around the formation with the guideon during a weekly battery runs at Fort Hood, Texas. FORT HOOD, Texas (May 15, 2009) - Every Friday Soldiers assigned to Headquarters and Headquarters Battery, 3rd Battalion, 157th Field Artillery, Colorado Army National Guard, wake up, don their physical fitness uniforms and go out on a battery run. "Most of the days of the week tend to blend, but you always know it’s Friday because of the battery run," said Sgt. Coe Gates of Pueblo, Colo.
"Physical fitness is one of our top priorities," said Capt. Ashkan Angha, HHB commander, of Boulder, Colo. 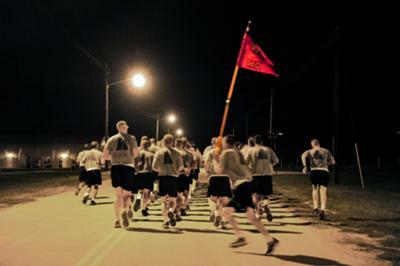 The Soldiers run varying distances each week, never running less than two miles. "This morning we ran three miles," said Angha. "By the end of our training cycle at North Fort Hood, we’ll probably get to six miles." "Being in good physical fitness not only helps Soldiers deal with stress and prepare themselves for Iraq, but it also counts toward their promotion points," said 1st Sgt. Ed Schwaigert, HHB first sergeant. Although Texas’ humidity has been tough on the Soldiers, running at sea-level is one benefit of training here. "It’s a nice change of pace to run at sea-level," said Sgt. 1st Class Deborah Manzanares of Fountain, Colo., with a smile. Running early in the morning, starting well before sunrise, the Soldiers run in formation and sound-off as loudly as possible calling cadence. "We expect all the NCOs (Noncommissioned Officers) to take turns calling cadence," Schwaigert said. "By calling cadence, the Soldiers stay in step and it also helps control their breathing," Angha said. "It also helps Soldiers practice taking charge of the formation and leading." Many of the cadences are repeated each week like "C-130 Rollin’ Down the Strip," "When My Granny" and "I can run to wherever just like this." Soldiers sometimes incorporate clapping into the cadence to get everyone motivated. Not only does the weekly run help the battery come together, but HHB Soldiers also enjoy giving the rest of the brigade a wake-up call bright and early, whether it’s the sound of them counting off to stretches, cool down or running/walking cadence. During the run, Soldiers get even more motivated and call cadence even louder when someone grabs the guideon, the unit flag, and runs around the formation. "Having guideon bearers is a military tradition, and it increases battery integrity when we have volunteers from the formation take the guideon and run around formation showing it off," said Sgt. 1st Class Gene Bendico of Colorado Springs, Colo.
"I think it’s important to run; this is a morale-booster to get everyone to run together as a battery," said Staff Sgt. Anthony Alston of Harrisburg, Pa. "It’s good to build your endurance and increase your stamina. This helps even more when we have to carry around a lot of equipment." "I enjoy that we are the only battery doing this," said Spc. Nicholas Mathis, a resident of Colorado Springs, Colo., with a smile. "It shows other units that we are willing to put out that extra mile for each other." Join in and write your own page! It's easy to do. How? Simply click here to return to YOUR Running Stories.